PAST 24 HOUR WHR SUMMARY...Evening thunderstorm, overnight showers. A clearance never disappoints. It is always on time, or so it seems. One last chance for Toowoomba this morning. Looking at the radar struggling to see where this 95% chance of 10-20mm is going to come from as per the Brisbane Forecast. Another BOM fail? Not sure why we still go through this on here after all this time. As Seabreeze mentioned, it does not mean 95% chance of 10-20mm. It means 95% chance of any rainfall, and if rain does fall, the likely amounts are 10-20mm. Those figures are also from midnight to midnight so it includes the rainfall that's already fallen since midnight. Hmmm, yeah that was a rain fail with the amounts forecast and what actually fell. Gfs downgraded from 30 to 3 yesterday morning which was pretty spot on, but then they upgraded it again later in the day. EC had 20-40mm falling which was nowhere near what anyone in the area received. Models seemed to really struggle with this one. Shame, we really needed the follow up from October. See what the rest of today brings. Lani: just wondering where you got EC's 20-40mm from? The 1st image below shows what's fallen since 9am yesterday up to time of writing (7am) while the 2nd image shows EC's forecast (using the previous night's 12z run) for the 24hrs up to 7am this morning with your area circled in red. As you can see, your area (if I've got your position correctly) is near the borders of the 10-15mm and 15-20mm areas... not 20-40mm. 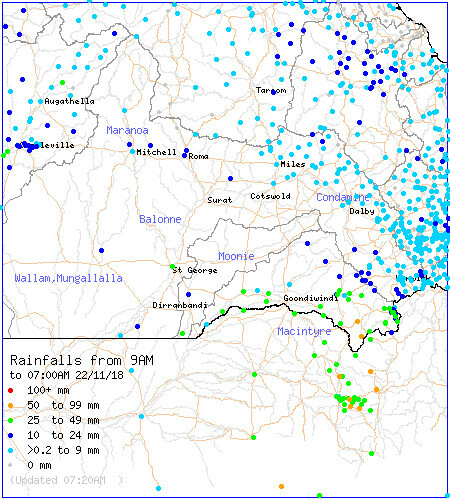 It also managed to capture the heavier falls around the southern Downs and northern tablelands although it did overestimate the falls in the Miles-Jandowae areas. Remains to be seen whether it'll capture the remainder of today's rainfall though. Looks like a decent mass of rain coming in from the west. I suppose for many, it's just anxiety. Basically from this time last year to the end of September, for most of NSW and certain parts of QLD, ended up with massive rainfall deficiencies. I suppose the thought of having to face another hot dry summer is not very pleasant. NW inland NSW and southern border of QLD have really done well. So is BoM sure that there is a 100% chance of a 95% chance of any rainfall and if it does there is a 50% chance of 10 mm and 50% chance there could be 20mm. Just every time it is discussed I am 110% confused why only 60% of people understand the 70% accuracy of the actual forecast. Bwahhahaha 類勞 sorry couldn’t help it. I bet BoM, if they ever read any of this must be going why did we do this percentage scenarios. Not taking taking the Mickey out of any one but just love the confusion. I have so many friends that just don’t get it even when you sit there and explain it as simply as possible. I think maybe they overthink it, where as Ken explained, it is pretty simple. Cheers everyone and enjoy whatever comes today and please don’t complain because next week is expletively hot. The answer to NotsohopefulPete, which I think he has just answered to what we face next. By the way we had a brief shower that I said may eventuate with some good static lightning. We were out and I was just looking at the car this morning and the rain had dirt in the mix so now I have to wash the car other wise it will scratch if I touch it. Brown rain drops all over the families cars. 2 daughters included. Torrential rain, lightning, and thunder Here. Yes, I get confused too. OzForecast has ADFD, OCF and GFS (sorry, I may have mixed up OCF with EC - What is OCF model?). ADFD and OCF were going for 20-40mm yesterday morning (ADFD slightly different but close to that). ADFD is saying now 18-32 for today LOL. GFS often has an amount then changes to ? which is probably the most accurate hahahaha. I'm not really bothered one way or the other, I just feel the amounts they've been progging for days really hasn't eventuated on the Downs and I know that someone on here informed that farmers don't look at models but perhaps they should read the FB page One Day to Rain and they might see just how many farmers do see the forecasts and pray on them to come true. 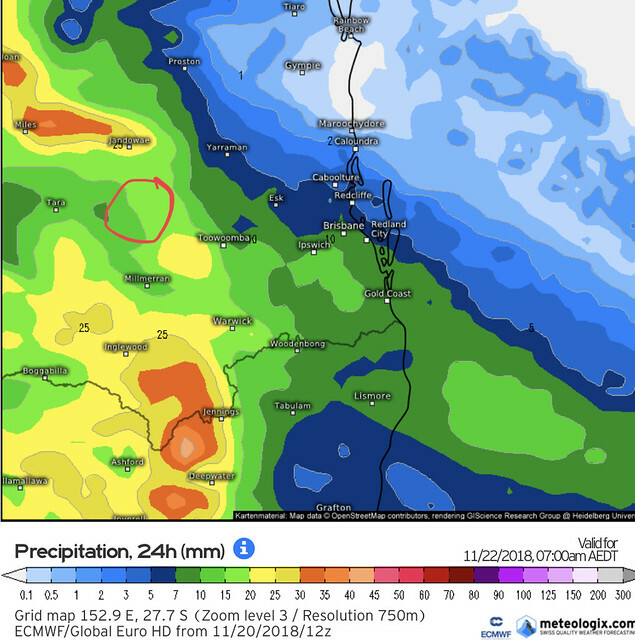 Given that yesterday's 9am rainfall finished this morning, and very few area's in the red circled area really got much more than 3mm, it would have been nice to get the higher end of the 10-20mm they've had on the forecast for a week. We can always hope! I'm not saying anyone was wrong, I just think they may have struggled with the set up a bit perhaps? Seem to have been closer to the NSW setup maybe? OCF is the system that uses all the main models. For rainfall amounts, it's a simple average of all the main models. ADFD is the Bureau's official forecast data (the end result of combining the models that the forecaster selects for each weather parameter before being manually adjusted). BTW some nice dusty images coming out of various webcams around Sydney now. Visibility at the airport down to 5000m last time I checked too. I thought you'd like that Ken. Isn't that exactly what I said? Chance of rain 95%. If it does rain then 10-20mm is expected. So 10mm is the minimum expected, 20mm the maximum, logic would dictate 15mm would be the average expected. Not sure where this 50% chance of 0.2mm comes from. Having said that there is a band of showers approaching, whether it reaches Brisbane hard to say, looks like it could miss to the south. Even so can't see 10-20mm coming from it and given the forecast of the afternoon clearing it look like another case of overestimation. "Looking at the radar struggling to see where this 95% chance of 10-20mm is going to come from as per the Brisbane Forecast. Another BOM fail?" I would question the value of a method if the average person is confused by it. Logically when people see 10mm-20mm forecast they expect they will at least get 10mm. It's simply confusing and illogical to suggest this really means only a 50% of 10mm. If that's the case the forecast should be 0-20mm. That is an impressive squall line that is showing up Pete. Time to crank up the laptop because the Doppler is spectacular and the iPad is useless with imgur etc. I simply cannot understand why such a basic concept is so hard to grasp and becomes the focal point of so much argument. It's not rocket science. One doesn't have to be a weather nerd to understand that there's a certain chance of any rainfall occurring and if it does rain, then a certain range of amounts is likely. Many other countries around the world have used chance of rain in their forecasts for many years without as much drama as this... but people here still seem to have enormous trouble grasping it and overthink it. So if does rain (95%) then there WILL be (100% chance) of 10-20mm? But it's not right, only 50% of 10mm. So why list a rainfall range of 10-20mm when the actual range they mean is 0-20mm? If's it's such a simple and logical system why are so many people confused by it? Maybe because it's not simple and logical? Why state 10-20mm of rainfall when they really mean 0-20mm? Did you actually read carefully what I wrote. The 50% was just a rubbish number I threw in there hence the explanation in the brackets. I was just throwing percentages around as a joke. Ken has explained so many times and others as well as posting the BoM explanation. Plus to answer your 1st question look at the radar for where the possible rain is coming from. Oh sweet lord, give me a break. It means 95% chance of ANY rainfall... and if it does rain, the most likely amounts are 10-20mm. Full stop. End of story. Seriously, how hard is that to understand?? ?